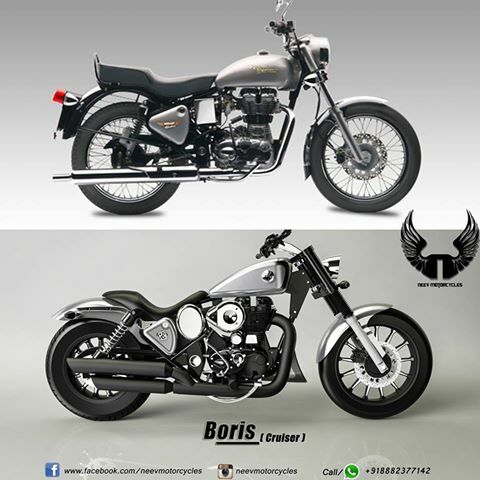 Neev Motorcycles have modified Royal Enfield classic into a Robust Cruiser "Boris". You can check out the image of the modified bike. One can easily see that modified bike is actually looking good. • Engine - Royal Enfield 500cc/ 350cc . • Electricals - Original Royal Enfield. Front - Disc 280 mm, Dual Piston Caliper. Rear - Drum / Disc. Front – Telescopic forks (Original Royal Enfield). Rear - Twin gas charged shock absorbers (Original Royal Enfield). • Hand fabricated sheet metal parts i.e. custom tank, front and rear mudguard, carb. cover , Belly etc. • Drop Down Mirrors (Black/Chrome). • Custom Dual glasswool exhaust. • Custom handlebar and risers. • Custom head light, tail light and turn signals. • Air filter – Original Royal Enfield / open air filter. • Custom made longer swingarm. • Custom paint , Chrome and detailing. • One branded helmet with the matching paint scheme and much more. In starting they are taking only 5 orders for the modification. If you want yours to be like this one then you can contact them. Sir what is the Modification cost for BORIS CRUISER..